The cotton rich material provides supreme comfort that is perfect for anytime wear. Comes in a pack of three - your choice of either assorted dark colours or brown and fawn. This T-shirt style thermal Vest is made from 50% cotton and 50% polyester, and is brushed inside for extra comfort. Pack of 3 new fit , soft handle woven classic boxer shorts in neat check prints. 50% cotton, 50% polyester with an elasticated waist band. 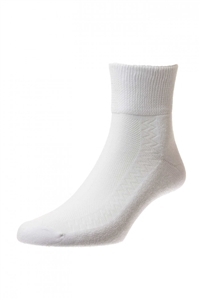 A seam free sock, suitable for diabetics, with a gentle grip honeycomb top and non-restrictive toe seams. 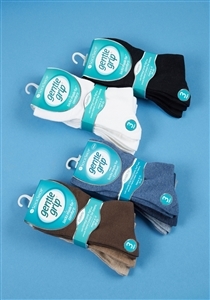 These high quality cotton-rich socks have a loose top, and so are less restrictive. This provides extra freshness and comfort. The sock is designed with three unique relaxation panels, which contract vertically so the socks stay up in comfort all day long without leaving marks on the legs or restricting circulation. Proven comfort, and highly recommended for those with circulatory problems. 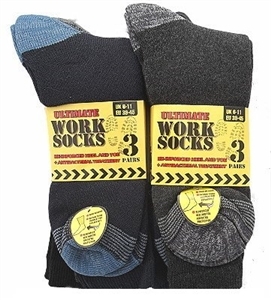 These wool-rich socks will ensure your feet are warm and comfortable all day long. Like our cotton socks, they have a loose top, and so are less restrictive. This provides extra freshness and comfort, and ensures that the socks stay up in comfort all day long without leaving marks on the legs or restricting circulation. Proven comfort, and highly recommended for those with circulatory problems. These hard wearing comfortable stone wash blue jeans are perfect for everyday casual wear whilst also suitable for a more dressy look. They are excellent value at £12.95 and are an essential part of any mans wardrobe. The perfect accompaniment for any trouser, this Mens Real Leather Belt has been crafted with a lustrous metal buckle and subtle stiching for supreme style. This shortsleeved shirt is a more casual version of our longsleeve, but still offers the quality and features of the original. This striped nightshirt is available in light blue and dark blue and is manufactured in Brushed Cotton for that extra warmth. Also try out 100% Cotton Nightshirt for warmer evenings. Feel the comfort and know the difference - a well-tailored shirt always looks the part. Classic plain 65% polyester, 35% cotton pyjamas with elasticated waist, long sleeves and piping detail to the jacket. Choose from navy, light blue, maroon and aqua. These mens elasticated waist shorts provide pure comfort via an active waist band that stretches as you move, they are perfect for relaxing in comfort on those sunny days.